There is a place that I have reviewed before, but hadn’t been back to since around the time that I started this blog, a year and a half ago. 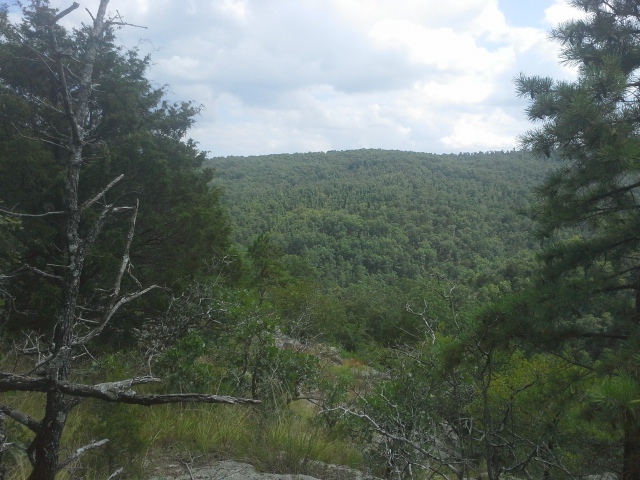 It is one of the most gorgeous and wild and beautiful places in Missouri, as far as I am concerned, and it really isn’t too far away (at least for me). It is a natural place where I feel a definite connection to the wilderness while I am in it. A place that lends itself to inspiring that rugged fantasy of living in the woods, finding a harmonic balance with the plants and animals dwelling there, and making my home and life in the topography of the sharp peaks and rock filled waterways. A place where for miles of surrounding trees and hills, the only human sound is the one made by the occasional jet flying way overhead. Welcome to Lower Rock Creek, flowing through Cathedral Canyon, below the scenic glades of Trackler Mountain. From St. Louis you get on Interstate 55 south to Highway 67 south. Take that all the way to Fredericktown until you get to MO E. Go west (right) on E for about 8 miles, and pretty soon after you cross the bridge over the St. Francois River, you will come to County Road 511, on your right hand side. Turn right on CR 511 and take that past the fields on either side about half a mile. The road will incline down and there is a little concrete bridge that goes over a creek (it was bone dry this past trip). Almost immediately past the bridge on the left is a gravel jeep trail. 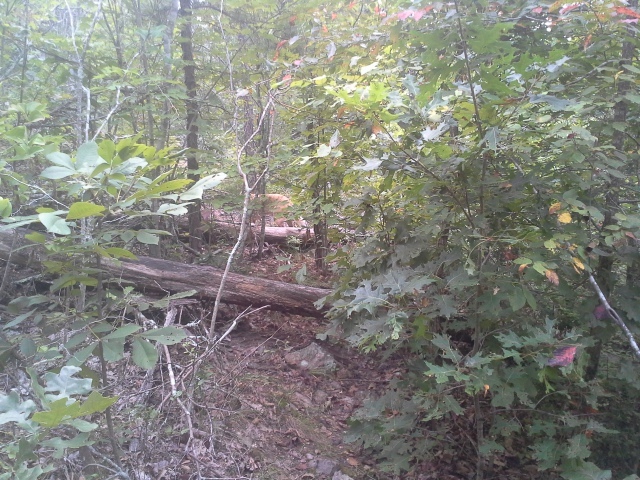 It looks like an opening in the forest for ATVs, but this is where you want to turn. That is the road to the parking area and trailhead. Take that for probably half a mile until you get to an old gate on the left, with the same stream you crossed over just beyond it. This is where you park. Beyond the gate and across the creek is the trail. There is another trail that heads out from the parking area parallel with the creek and up the hill, but I have no idea where that one goes, yet. 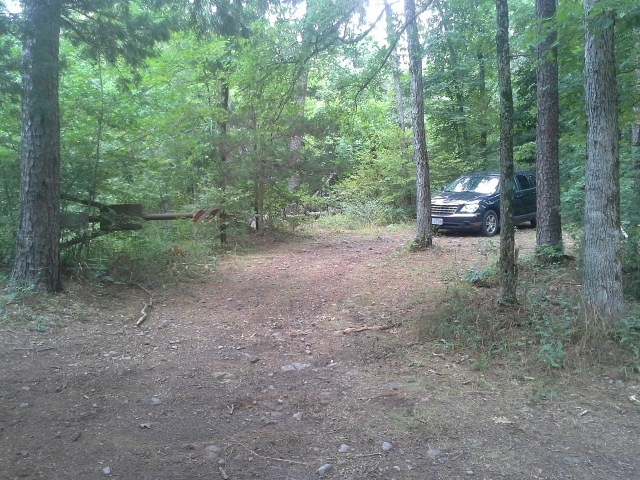 If you don’t feel that your vehicle can make it all the way down this uneven and narrow jeep path, there are a couple spots on the way that you can park at. 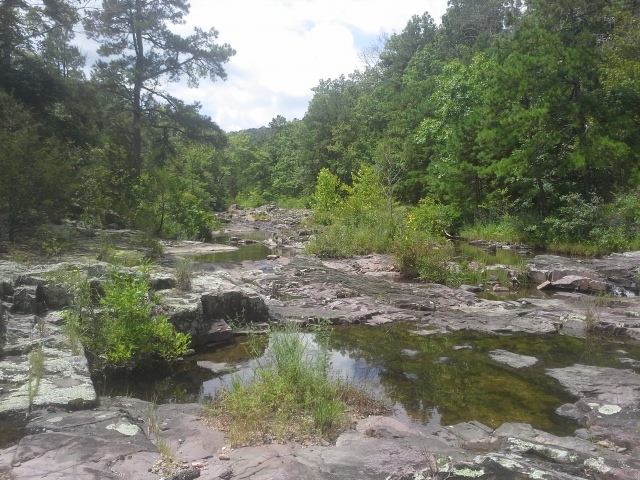 So you cross the creek, and follow the trail for just a short length to where it splits off in a fork. Take the left fork (there is probably a rock arrow on the ground pointing the way), and head through Wolf Hollow for about a mile until you emerge from the forest at Lower Rock Creek. Turn to your right and follow the creek upstream, over the rocks, through the trees, around the bends and over all the logs, until after about another mile you come to the vertical rock face of Cathedral Canyon, beyond the trees and across the creek from you. 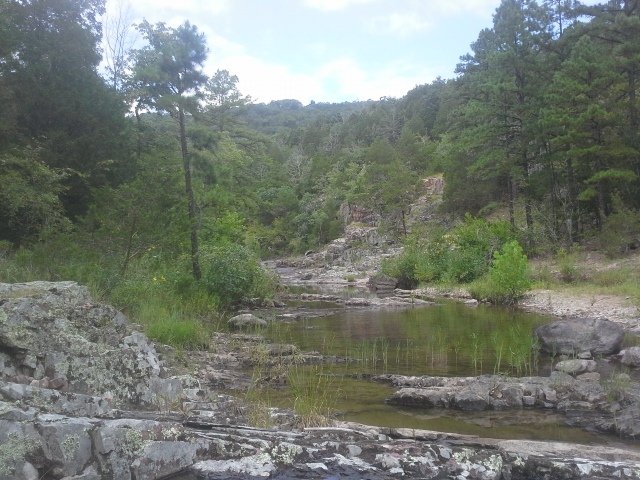 In this bend of the creek is an established backpacking site, and you will know you are there when you find the two fire rings and the central “Table Rock”. This is where I like to spend the night when I am visiting. The isolation. 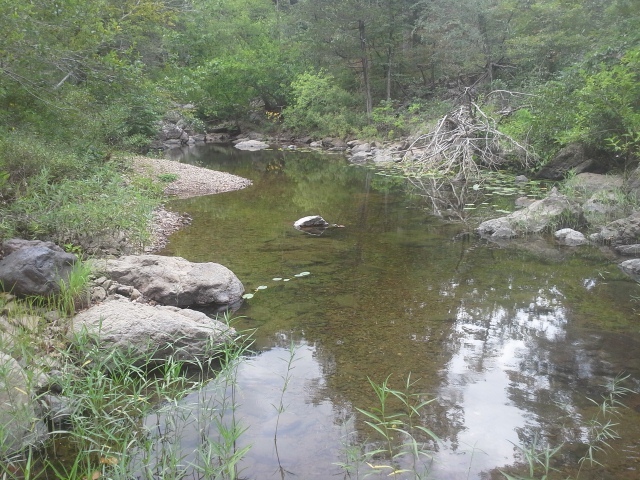 Deep in this canyon, next to the creek, you feel as if all other human beings are so far away. That you are in the wilderness, and you can unplug from the stresses that plague and control our lives. Time is spent gathering firewood, playing in the creek, climbing the surrounding mountains, communing by the fire. There is nothing to do in that place that isn’t about strengthening yourself and your connection to nature. 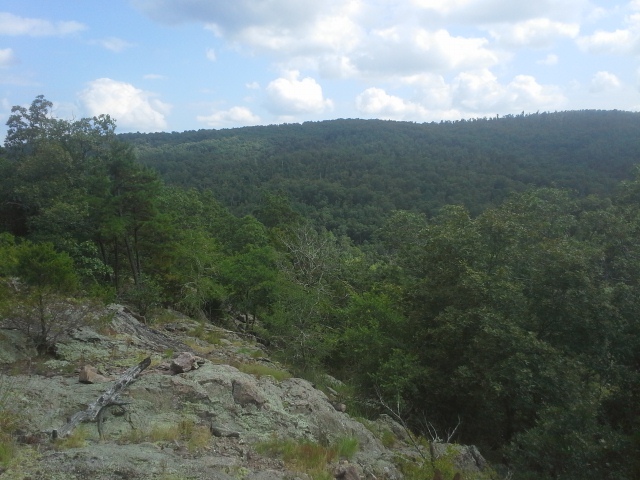 Some people might even say that they have experienced moments of authentic spiritual energy, sitting on one of the rock outcroppings in a glade near the top of Trackler mountain above the backpacking site, looking off into the distance at the nearby mountains and clouds and birds…but maybe you would just think I was crazy. 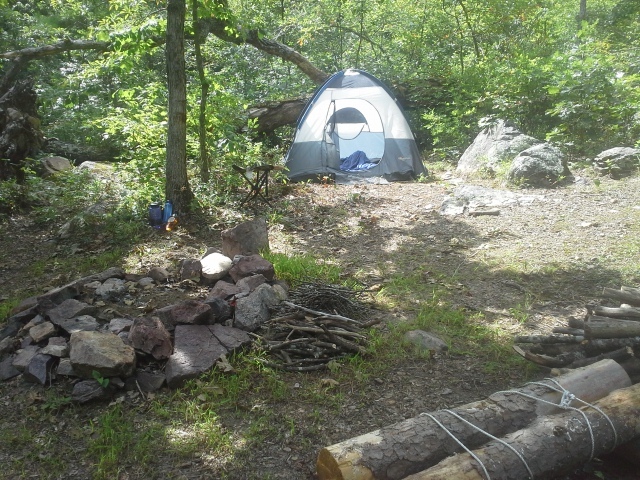 The established backpacking site. In the interest of leaving no trace, a site that is already there allows a person to feel as if they are not being as disruptive as they could have been, had they needed to build their own fire ring and clear a space for their tent. 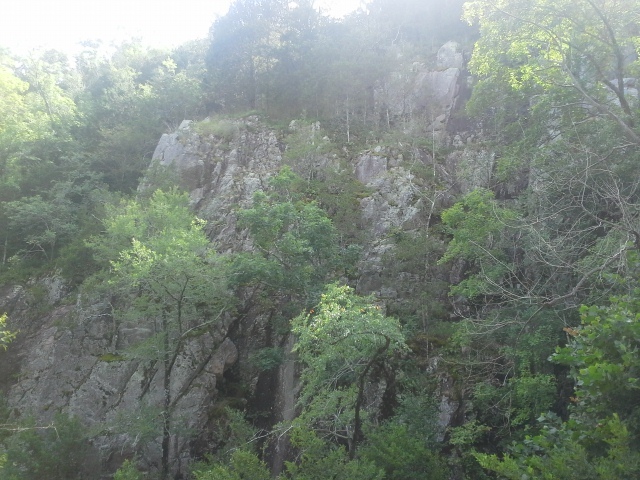 I would love for there to be spots like this all over in the wilderness areas throughout Missouri. The jeep trail in is the kind of road that you need to take slowly. It isn’t impassable, as I can get my Pacifica down it, but there are a lot of big rocks and roots in its surface between the mud and dirt. And the branches and sticks on either side of it that want to scratch your paint job will make you cry by the time you are just a little ways down it, if you are of the persuasion to care about that sort of thing. Don’t take your Mercedes on this excursion. The first part of the trail, from the parking lot through Wolf Hollow to the creek is an exercise in deception compared to the stretch along the creek and into Cathedral Canyon. Sure, you have to step over a fallen log here and there, duck under one (to the point of crawling if you have a full pack on), and maybe deal with a spider web or two. This is the EASY section of the trail. The second section along Rock Creek is very rugged and will take you into spots where you must scramble across or up extended loose rock piles, duck under or push out of your way branches that are clearly trying to stop you from advancing, and more often than not playing “find the trail” as the one you were on just kinda vanished. It is not for the beginning or out of shape backpacker, as it requires maneuvering of weight that isn’t typical of just hiking down a trail. Consider yourself lucky if you don’t stumble or fall at least once. Watch your step. I love this place…and it is a place that I must also confess, part of me doesn’t feel inspired to share with anyone, due to my own selfishness. I have come to realize that a lot of the places I visit that I end up sharing on this blog comes with a cost. The cost of OTHER people knowing about it. The cost of the loss of a little bit of the isolation. The cost of the chance that I will likely show up one late morning, and the parking area will be full (TWO cars?!? Dang it!) and the backpack site occupied. The cost of the trail being widened and paved, and billboards being raised alongside it. …Surely this is an exaggeration, but a cost that comes with the realization that other people may visit it too, diminishing somewhat the wildness through unintended exposure to the things that come with foot traffic. That one person out of one hundred that tosses their Gatorade bottle into the woods next to the trail. That is the guy we all need to not be, when we head into the woods. Because let’s face it, these places are so neat and amazing and enriching that they need to be shared. They hold a natural beauty that within it lies an energy that is good for a person, and we all should go there at least once in our lifetime. So let’s visit them with respect and care. Not just for our own experience, but for everyone else we share it with, so they can have their moment in a glade on the side of Trackler Mountain too. Great stuff, man. Totally dig your site. Thanks man! It is a labor of love. I just stumbled across your blog and I love it! Keep up the great work and keep exploring! Thank you! Looks like Planned Spontaneity isn’t too shabby either. In fact, looks like I could learn a thing or two myself. Thanks for checking this out! I, too, have hiked along Lower Rock Creek a couple of times. It is an amazing area. I have also taken the right fork which will take you to either a climb up a steep draw or a climb up an old logging road to the top of Trackler. Up on top there are lots of downed trees to work your way around. It’s not for those looking for an easy hike! Just found this. Thanks for the write up! Great job! 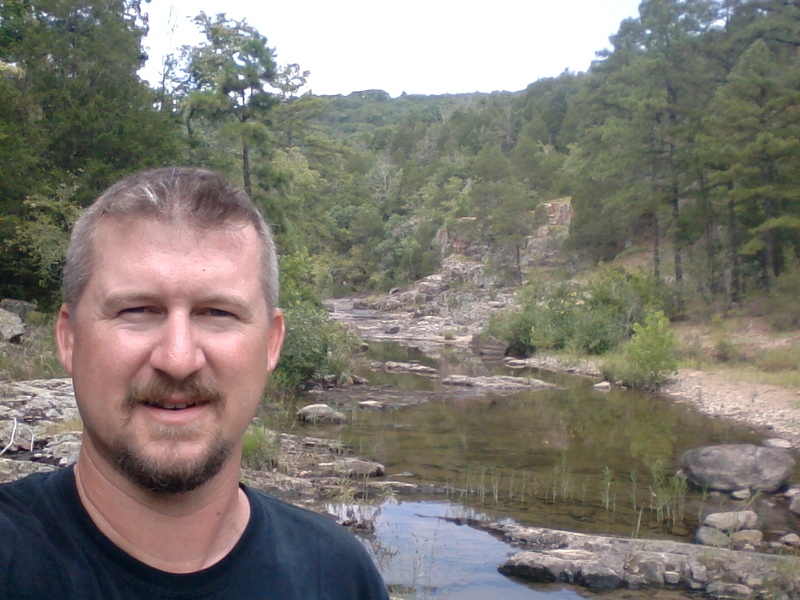 Great hike today. I have kayaked it twice at high water. First time to walk in and see the river base. Thanx for sharing.